The Copper Boat Ramp on Applegate Lake is a good place to get wet in the Siskiyou mountains in Southern Oregon. 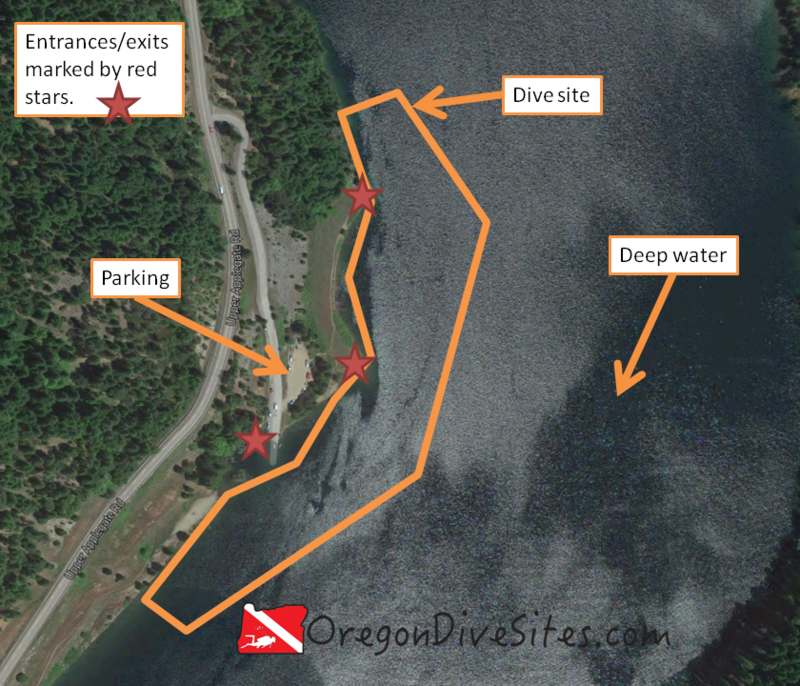 It is one of several boat ramps with good access for SCUBA divers along Applegate Lake. This being a fresh water reservoir, you will see the standard stuff we expect in Oregon’s man-made lakes such as trout, bass, and other fish; old tree stumps; and the occasional lost fishing rod. Around the boat ramp you’re more likely to find things dropped by boaters. 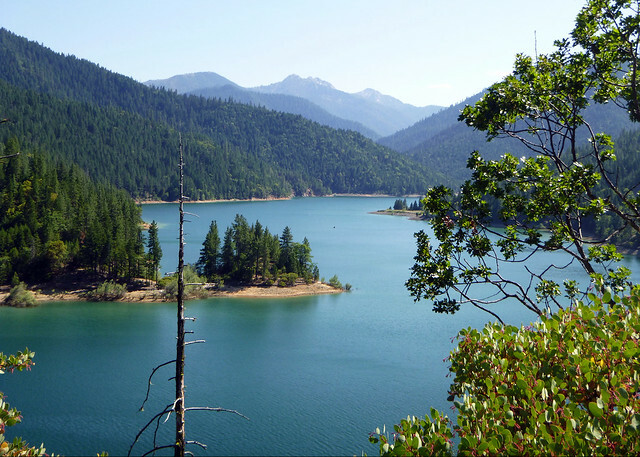 Applegate Lake is an excellent place to do some diving in Southern Oregon. The little town of Ruch is the first place of any size that you will find heading downriver from the lake. Medford and Grants Pass are just a little further away. Once you pass the dam on Upper Applegate Road, keep heading south until you see signs for the Copper Boat Ramp. There is parking near the boat ramp. Don’t take up spaces for trailers unless you have a trailer. When we visited last, there was no fee to park but that could change in the future. The Copper Boat Ramp on Applegate Lake in the Siskiyous is a good place to get wet in Southern Oregon. The dive site is the flooded canyon of the Applegate River. The land you want to come back to is to the west. Deeper water is to the east. If you start going uphill headed east, you’ve passed the deepest part of the dive site and are heading toward the opposite bank. There are a lot of easy entrances/exits here depending on what you want to do. If you want the easiest entry, just walk on in near the car parking area or over the boat ramp. Copper Boat Ramp is a fresh water dive. In the late summer or early fall the water can get a little stagnant if there hasn’t been rain for a long time and if it was a bad snow year the previous winter. In the winter, the lake can be drawn very low prepping for spring rains. Normally you’ll get 10-15 feet of viz here although the bottom can be stirred up so be sure to steer clear of it. In the early spring when snow melt is pumping into the reservoir, you might find water in the 37F range. Late in the summer, the Copper Boat Ramp can get a thermocline with temperatures in the upper 60s near the surface and in the low 50s at depth. This site is good during the summer and sometimes in the fall, depending on lake water levels. When the reservoir is full, you can hit around 80-90 feet at this site in the deeper section beyond where we drew the site boundary. This is an altitude dive. You should have altitude diver training to dive this lake. Open water divers with altitude training can successfully dive this site. We believe this site is suitable for freshly certified open water divers with altitude specialty training. Depending on where you park and lake levels, you might walk 50 feet or 500 feet to your entrance/exit. There is a lot of boat traffic at the Copper Boat Ramp and in Applegate Lake during boating season (summer and fall). Be sure to fly a dive flag. We have one we use when we go diving in Oregon. There are SCUBA shops in Grants Pass and Medford as well as over in Klamath Falls. Jacksonville has some good food. We haven’t tried any of the closer options so please let us know if you have a favorite place to eat. There is a lot of primitive camping and there are a few campgrounds in the area. We haven’t found a diver-friendly hotel between Ashland and Grants Pass yet. Please let us know if you know of one that will welcome SCUBA divers and their wet gear.